JB Rawcliffe & Sons Ltd provides services that cover all aspects of transport, including general cargo, movement of indivisible and abnormal loads, heavy haulage, cargo handling, hydraulic gantry mega lift systems, jacking, rigging and skidding, as well as storage. All services are handled safely by trained personnel using the latest specialist equipment. The company prides itself on providing cost-effective engineered solutions for the movement and handling of heavy and abnormal loads. Abnormal indivisible loads come in all sizes, they can be tiny but incredibly heavy, or huge but light. Plus they often have awkward shapes and geometry that need accommodating to allow them to be transported. JB Rawcliffe & Sons Ltd has the unique knowledge and experience to consult and advise customers on the most practical transport solution for how the cargo is loaded and transported, this can include adapting the load to allow it to be carried on standard route to reduce time and cost. We can design and build the special support steelwork to support different loads if required. Planning the correct route is extremely important where clearance and structure loading are factors. JB Rawcliffe & Sons Ltd can perform feasibility studies for a wide range of abnormal indivisible load transport projects, as well as projects involving the installation of equipment and machinery in facilities such as substations and underground facilities. Where issues are found with structures needing to be crossed en route that cannot be bypassed, JB Rawcliffe & Sons Ltd provides a unique range of over-bridge and flyover systems that can be configured for quick and easy installation. These over-bridge and flyover systems ensure that no loadings are placed on the structure itself. This eliminates the need to performing a bridge assessment, which can be costly especially if several structures are needing to be crossed. Our industrial division specialises in industrial handling, installation and removals of equipment at plants. We have a comprehensive array of fully tested and certified equipment, which can be adapted to the most challenging project such as turn tables, machine skates, air skates, and our in-house designed and manufactured hydraulic skid system. All aspects of machinery installations are undertaken to give a complete turnkey operation to the customer, whether it is power transformers, generator transformers, stators, generators gearboxes gas turbines, steam turbines or switch rooms. Our teams can shift the heaviest objects and load them on-site and unload them on delivery. JB Rawcliffe & Sons Ltd works closely with power stations during shutdowns and outages to provide efficient, cost-effective and time sensitive solutions to projects. We provide our own diesel and electric forklift trucks with operators as part of our installation and removals service. JB Rawcliffe & Sons Ltd offers a 500,000kg hydraulic gantry lift system from the simplest to the most complicated gantry lifting operations with its highly trained and experienced staff. The Mega Lift Hydraulic Gantry System is for lifting operations in confined areas. The system also has the advantage over a crane of similar capacity due to its compactness and operational costs. Lifting plans with 3D modelling can be produced as part of the method statements and risk assessments for the project. The system can be utilised from a ‘simple’ lift in a low headroom building, to lifting and carrying of large loads using a variety of track options. JB Rawcliffe & Sons Ltd can combine heavy turntables, skid systems and side shift capabilities for advanced and precise handling during innovative lifting operations with the integration of our machinery handling department. The system is easily transported and quickly rigged, it can be containerised and shipped anywhere in the world. It is powered by two LPG engines for a clean and quiet self-contained operation. Safety in lifting operations is our first priority, with weight, pressure and height monitored for each tower on the control panel by the operator with safety alarm systems in place. JB Rawcliffe & Sons Ltd provides bonded industrial storage in our on site insulated secure storage hall. The storage hall has 1,400m² of floor space and a 20,000kg overhead crane with 7,750mm underneath the hook and pulling points located in several locations for the skating of heavier pieces. Outside secure customs approved bonded storage is also available with an 80,000kg capacity crane for use. Internally and externally, the company can off-load and place heavier items into storage with our own installations / removals teams. The company’s 12 acre site is fully secure with 24-hour security and monitored CCTV. The company can handle various containers, including oversized, open-top, flat racks and purpose-built units. These can be transhipped and placed either into storage or to another vehicle for onward travel. Our warehousing and storage capabilities are flexible enough to accommodate specific customers’ needs. JB Rawcliffe & Sons Ltd offers the facility of stooling out equipment, either at our site or at the customer’s premises. This allows equipment to be safely supported beneath its base on stools/tubs, to enable the transport equipment to be removed quickly and easily, and in return when the equipment requires delivering the loading can be performed quickly and easily. This removes the need for expensive cranes to offload and reload the equipment. Over the last 30 years, the company has been involved with the recovery of ‘lost’ loads, from roadside accidents to customer property incidents. With decades of invaluable experience in handling abnormal loads and access to virtually unlimited lifting and transport capabilities, we are able to engineer solutions for the recovery using a range of available specialist equipment. We understand the need to minimise damage in recovery and offer a discreet service, with the accessibility to provide alternate transport and secure storage of recovered equipment. 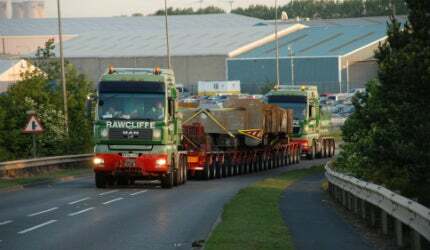 Established over 45 years ago, JB Rawcliffe & Sons Ltd provides a professional service, covering all aspects of transport, including general cargo and the movement of indivisible and abnormal loads, heavy lifting, installations and removals, jacking, skidding, and rigging.